Considering a lot of people use trains in India, train tickets tend to be cheap, depending on class of travel, of course. What I am interested in is finding out which train ride or which route (since there can be different types of trains on the same route) has the most expensive one way ticket for each of the following classes - General compartment, Sleeper class, any of the AC classes (it will most likely be 1AC but perhaps I'm wrong) and finally AC chair or any other uncommon class. As a bonus question I'd like to get a list of deluxe tourist trains such as Palace on wheels and prices for those trains. I see that every answer here is going on and on about special, luxury trains. This is specifically what the OP does NOT want. Trains in India have a hierarchy, trains higher up in the hierarchy are usually costlier. There are some exceptions, such as 'Garib Raths' where the air-conditioned fares are lower than those of 'Express' or 'Mail' trains, but by and large this list shows the hierarchy of trains. Within a specific hierarchy (such as 'Express') and for a specific fare class such as 'sleeper' or 'third sleeper', the fare is proportional to distance. This implies that for 'regular' trains, the most expensive fare simply depends upon the distance. This can be found from the list of longest train journeys in India. The Golden Chariot is the South Indian equivalent of Palace on Wheels. It costs $5278 ($4795 during Off-peak season) per person for a 7 night round trip Bangalore to Bangalore tour. One can book tickets on per night basis too $754 per night ($685 off peak). Deccan Odyssey, which covers the pristine beauty of Konkan coast, mostly in Maharashtra and Goa. The Duration is 7 Nights / 8 Days and prices start from USD $2795 per person for the return trip. The destinations are: Mumbai > Sindhudurg Nagari > Goa > Kolhapur > Aurangabad (Ellora) > Chandrapur (Tadoba Wildlife sanctuary) > Wardha (Sevagram) > Jalgaon (Ajanta) > Nashik > Mumbai. The train has 11 fully air-conditioned Deluxe Cabin saloons, each with combination of 4 twin bedded chambers and Saloons are equipped with channel music, intercom, player, attached toilets, running hot and cold water, shower, wall-to-wall carpeting and other amenities. Indian Splendour is a 8 Days / 7 Nights one-way journey from Delhi to Mumbai, which covers Delhi-Agra-Ranthambore-Jaipur-Bikaner-Jodhpur-Udaipur-Balasinor-Mumbai. The adult fare starts at USD $5560 for a Deluxe Cabin Twin/Double. The Heritage of India is a 8 days/7 nights one-way trip from Mumbai to Delhi, which covers Mumbai- Ajanta – Udaipur- Jodhpur- Bikaner-Jaipur-Ranthambore-Agra- Delhi. The adult fare starts at USD $6360 for Deluxe cabin twin/double. Treasures of India is a 4 days/3 nights round trip from Delhi. It covers Delhi – Agra – Ranthambore – Jaipur – Delhi. The adult fare starts at USD $3580 for Deluxe Cabin twin/double. Gems of India is a 4 days/3 nights return trip from Delhi. It covers Delhi – Agra – Ranthambore – Jaipur – Delhi. The adult fare starts from USD $3580 for Deluxe Cabin twin/double. Indian Panorama is a 8 days/7 nights return trip from Delhi. It covers Delhi-Jaipur- Ranthambore-Fatehpur Sikri – Agra – Gwalior – Orchha – Khajuraho- Varanasi – Lucknow – Delhi. The adult fare starts from USD $5560. More details on the above trains - detailed itinerary, accommodation, facilities, general information, departure dates is available on The Maharajas website. 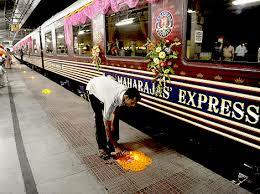 Maharajas' Express, is one of the Most Expensive Trains in India. For 8 days this pan Indian train takes guests on a ride across the best and the most prominent destinations of the country - Taj Mahal, the Khajuraho temples, wildlife environs of Ranthambore, Fatehpur Sikri and the holy bathing Ghats of Varanasi. The cheapest rate per person per day is a whopping US$ 800 for a Deluxe cabin. The next two slabs are US$ 900 and US$ 1,400. And the Presidential Suite comes for US$ 2,500. The Maharajas' Express will have 88 passengers (a normal III AC coach packs in 72) living in suites fit for a prince. All food and drinks are complimentary. Trains in India are a pure nostalgia; reminiscent of summer holidays, vacations, bittersweet memories, and family bonding over extended trips while traveling across the nation. There’s something exciting about the journey, more than the destination. Not the answer you're looking for? Browse other questions tagged trains india factoids or ask your own question. What is the longest train ride starting in the EU, now that Sibirjak is discontinued? What is the most expensive regularly scheduled flight?